“A nation that continues year after year to spend more money on military defense than on programs of social uplift is approaching spiritual doom.” ~ Martin Luther King, Jr.
By 1967, Martin Luther King, Jr. had become the country’s most prominent opponent of the Vietnam War and a staunch critic of overall U.S. foreign policy, which he deemed militaristic. Time magazine called the speech “demagogic slander that sounded like a script for Radio Hanoi,” and the Washington Post declared that King had “diminished his usefulness to his cause, his country, his people. 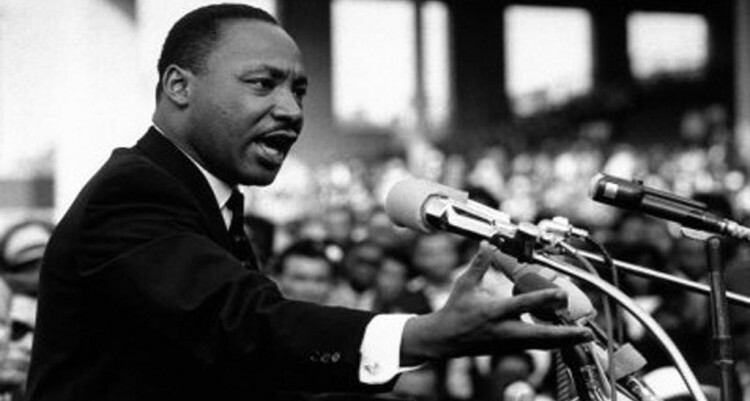 He was never just the “I Have a Dream” speech… He was an anti-war, anti-materialist activist whose views on American power would shock many of the same politicians who are currently scrambling to sing his praises. The war in Vietnam is but a symptom of a far deeper malady within the American spirit and if we ignore this sobering reality we will find ourselves organizing clergy- and laymen-concerned committees for the next generation [protesting American wars around the globe]. We will be marching … and attending rallies without end unless there is a significant and profound change in American life and policy. We as a nation must undergo a radical revolution of values. We must rapidly begin the shift from a ‘thing-oriented’ society to a ‘person-oriented’ society. When machines and computers, profit motives and property rights are considered more important than people, the giant triplets of racism, materialism and militarism are incapable of being conquered. My third reason moves to an even deeper level of awareness, for it grows out of my experience in the ghettos of the North over the last three years — especially the last three summers. As I have walked among the desperate, rejected, and angry young men, I have told them that Molotov cocktails and rifles would not solve their problems. I have tried to offer them my deepest compassion while maintaining my conviction that social change comes most meaningfully through nonviolent action. This business of burning human beings with napalm, of filling our nation’s homes with orphans and widows, of injecting poisonous drugs of hate into veins of people normally human, of sending men home from dark and bloody battlefields physically handicapped and psychologically deranged, cannot be reconciled with wisdom, justice and love. A nation that continues, year after year, to spend more money on military defense than on programs of social uplift is approaching spiritual death. FOOTNOTE 1: “Breaking the Sound Barrier,” by Amy Goodman with forward by Bill Moyers.